In Vancouver, British Columbia, the circular economy is thriving. The total number of green jobs has increased by over 600 in Vancouver alone since 2010. And across the rest of British Columbia, circular economy businesses and social ventures provide over 13,000 jobs, says Vancouver Economic Commission in a 2018 report. We’re not alone, either: the Canadian waste management industry generates over $7.3 billion a year (Statistics Canada, 2015). These figures highlight yet another significant trend – Canadians are becoming more waste-conscious. Movements like #plasticfreejuly and annual awareness weeks like #WasteReductionWeek are helping educate residents about how we can all transition to a waste-free future. But when it comes to the circular economy, you could be asking yourself: what is it and how does it apply to you? It might be surprising to learn that the concept of a circular economy isn’t exactly new. It was mentioned as early as 1972 when an MIT research team released a report called ‘The Limits to Growth‘. They modelled a scenario about what would happen if the human population kept growing in a world with limited resources. The results were worrisome: it showed that if we didn’t change our consumption habits as a society, there’s only so much the Earth can provide for us. The report warned that we’ll reach the limit of Earth’s resources by the end of the 21st century — if we don’t shift to a greener, sustainable economy (Meadows et. al, 1972). Over the years, the concept of ‘limits to growth’ became the building blocks of the circular economy we know today. In a circular economy, waste materials (known as material outputs) are repaired, reused, recycled, or remanufactured instead of being thrown away in landfills (RCBC, 2018). Instead of needlessly throwing goods away at the end of their life cycle, these materials are reused as the building blocks of new products. The circular economy doesn’t just stop here, though: it also supports product manufacturing and R&D. In this case, products are made with the end in mind. Companies ask: what would happen to a product when it’s of no use anymore? Does it get thrown in landfills? Recycled? Does it biodegrade? If not, can we make it biodegradable? Or can we design products to last? 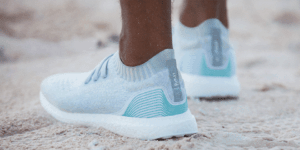 Major companies like H&M, Patagonia, and Adidas are all involved in the circular economy. And many local Vancouver & Canadian brands are part of the circular economy too: Novel Supply Co, Free Geek, Wood Source Co-op, ChopValue Manufacturing, Royal Printers, and West Coast Wood Works to name a few. There is much to celebrate these days – including the businesses, institutions, and residents involved in the circular economy. Yet there is still much more to be done. 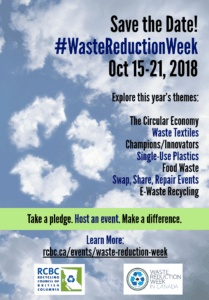 It just so happens to be Waste Reduction Week next week from Monday, Oct. 15th to Sunday, Oct. 21st across Canada – where we invite you to join us and hundreds of other businesses and residents to raise awareness about waste reduction in Canada! From topics such as the circular economy to food waste, every day next week presents a unique topic that hopefully will inform and inspire.